This study examined the association between unusually high temperature and daily mortality (1997–2007) and hospital admissions (1997–2010) in the Sydney Greater Metropolitan Region (GMR) to assist in the development of targeted health programs designed to minimise the public health impact of extreme heat. Sydney GMR was categorized into five climate zones. Heat-events were defined as severe or extreme. Using a time-stratified case-crossover design with a conditional logistic regression model we adjusted for influenza epidemics, public holidays, and climate zone. Odds ratios (OR) and 95% confidence intervals were estimated for associations between daily mortality and hospital admissions with heat-event days compared to non-heat event days for single and three day heat-events. All-cause mortality overall had similar magnitude associations with single day and three day extreme and severe events as did all cardiovascular mortality. Respiratory mortality was associated with single day and three day severe events (95thpercentile, lag0: OR = 1.14; 95%CI: 1.04 to 1.24). Diabetes mortality had similar magnitude associations with single day and three day severe events (95thpercentile, lag0: OR = 1.22; 95%CI: 1.03 to 1.46) but was not associated with extreme events. Hospital admissions for heat related injuries, dehydration, and other fluid disorders were associated with single day and three day extreme and severe events. Contrary to our findings for mortality, we found inconsistent and sometimes inverse associations for extreme and severe events with cardiovascular disease and respiratory disease hospital admissions. Controlling for air pollutants did not influence the mortality associations but reduced the magnitude of the associations with hospital admissions particularly for ozone and respiratory disease. Single and three day events of unusually high temperatures in Sydney are associated with similar magnitude increases in mortality and hospital admissions. The trend towards an inverse association between cardio-vascular admissions and heat-events and the strong positive association between cardio-vascular mortality and heat-events suggests these events may lead to a rapid deterioration in persons with existing cardio-vascular disease resulting in death. To reduce the adverse effects of high temperatures over multiple days, and less extreme but more frequent temperatures over single days, targeted public health messages are critical. Extreme heat events are known to contribute to an increase in mortality and morbidity, particularly in vulnerable populations [1, 2]. Early Heat Health Warning Systems (HHWS) have been shown to reduce morbidity and mortality during heat-waves (periods of unusually high temperature) [3–6]. HHWS rely on a number of components including timely and reliable meteorological data, an understanding of who is at increased health risk due to heat-waves and effective public health risk communication . There is mounting evidence that heat-waves are increasing in frequency, duration and intensity as part of climate change . Studies indicate that populations acclimatise to their regional climate and that a population’s response to a heat-wave is influenced by this acclimatisation . Understanding the impact of climate on population health is the key to reducing the burden of disease due to climate change in Australia . Much of the research linking heat-waves to excess mortality and morbidity has been conducted in the regions of the northern hemisphere where heat-waves are rare events [10–12], although some northern hemisphere locations do experience heatwaves on a regular basis [13–15]. Although heat-related mortality [9, 16–19] and morbidity [9, 18–21] studies have been conducted in Australia, study methods and the population groups assessed have varied considerably. This study builds on recent research conducted by Khalaj and colleagues  in the Sydney Greater Metropolitan Region (GMR) which used a case-only design to identify underlying conditions that modify the health risk associated with heat-waves. Khalaj and colleagues  found that people admitted to hospital with underlying mental and behavioural disorders, diseases of the nervous and circulatory system, diseases of the respiratory system and renal disease are more susceptible to extreme heat events. The case-only study design used by Khalaj is useful in determining which groups of patients are more susceptible to extreme heat events but cannot be used to provide quantitative estimates of the overall increase in deaths or the demand for health services during such events. This study aims to quantify the association between unusual heat events and mortality as well as morbidity (hospital admission) in metropolitan New South Wales (NSW), Australia and inform the development of a state-wide HHWS. In addition, this study will help determine the extent to which northern hemisphere studies are generalisable to an Australian setting where the temperature threshold of unusual heat events is substantially higher than in the northern hemisphere . In Australia there is lack of consensus on the definition of unusual heat events with the Australian Bureau of Meteorology defining a heat-wave as a period of more than a few days in a row of above average temperatures for a given location . Mortality data for all deaths of NSW residents between 1st July 1997 and 31st December 2007 (inclusive) were obtained from the Australian Bureau of Statistics (ABS) . Data on all hospital admissions of NSW residents from 1st July 1997 to 30th June 2010 inclusive were obtained from the NSW Department of Health . 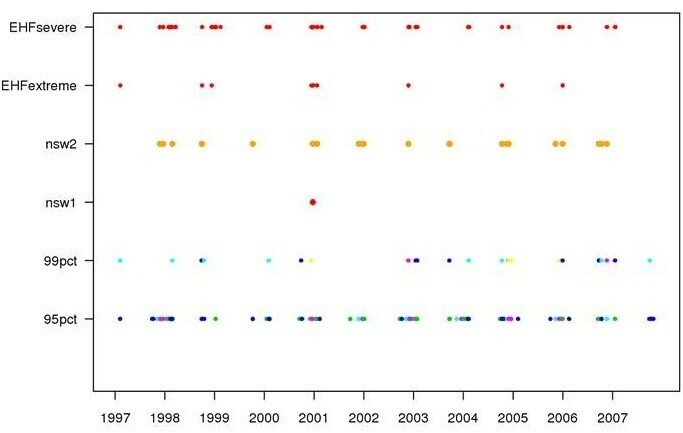 Meteorological data on temperature (daily minimum, maximum, mean), humidity (daily minimum, maximum, mean) and wind speed (at 9 am and 3 pm) were obtained from the Australian Bureau of Meteorology (BoM) for all monitoring stations in the Sydney Greater Metropolitan Area (GMR) from 1997 to 2010. Our analysis focused on the (southern hemisphere) spring and summer months of September to February. We included spring months because early heat-waves can occur during this time and poor acclimatisation to warm weather following the winter months has the potential to increase the likelihood of heat-related illness . Sydney experiences cooler nights in the inland (Sydney west) zone, and cooler days in the coastal (Sydney east) zone. Previous work by Khalaj et al. used data from all Sydney weather stations to define two Sydney climate zones (Sydney east, Sydney west) by maximising the ratio of between-region to within-region temperature variance. In this study Statistical Local Area (SLA) of residence was used to assign mortality and hospital admissions data to each of the five climate zones of Sydney east, Sydney west, Gosford/Wyong, Newcastle, Illawarra . Daily weather data were obtained for all BoM stations within 50 km of the population-weighted centre of each SLA . The daily average was calculated as the inverse distance weighted average of all validated observations on each day. The distance weighted averages from the population centres were used because we assumed these estimates more closely relate to the experience of the population, rather than that at airports or other locations . The population centre was calculated using data from the 2006 Australian Census . Figure 1 illustrates the study region including the temperature zones, weather and air pollution monitoring stations. Map of study region including temperature zones and weather and air pollution monitoring stations. Hospital admission and mortality data based upon study subjects’ usual place of residence were mapped to SLA 2006 boundaries. While our literature review identified many variations in disease categorisations for both mortality and hospital admissions in previous studies, these variations were generally minor and concerned relatively infrequent diagnoses. Mortality was grouped into categories based on the underlying cause of death (i.e. the disease or injury which initiated the train of events leading directly to death). Categories used were based on International Classification of Diseases – 10 (ICD-10) coding informed by previous research (Additional file 1). Hospital admissions were analysed in similar groups based on ICD-10 coding (Additional file 1). We defined heat-waves using two heat metrics: daily apparent maximum air temperature (TAppMax)  and daily maximum temperature (Tmax). Apparent temperature is a measure of relative discomfort due to combined heat and high humidity. This measure was developed by Steadman [30, 31] on the basis of physiologic studies on evaporative skin cooling and can be calculated as a combination of air temperature and dew point. The occurrence of negative dew point values in Australian data makes the use of the commonly used Kalkstein and Valimont  apparent temperature formula invalid as it involves taking the square of dewpoint, which introduces a sign error on days of low humidity. In this study we used the Steadman  formula. Daily maximum temperature is the highest temperature reached in a given location over a given 24 hour period from midnight to midnight. We defined single day severe heat events as days where the temperature metric exceeds the 95thpercentile of the monthly distribution for the study period in that zone. Similarly, three day severe heat events are defined as days when the three day moving average (lags 0–2) exceeds the 95thpercentile. We then defined single day extreme events as days when the temperature metric exceeds the 99thpercentile of the monthly distribution for the study period in that zone, and three day extreme events (or heat-waves), as days when the three day moving average (lags 0–2) exceeds the 99thpercentile. The association between mortality and hospital admissions with severe events provides information on the health effects associated with relatively regular heat events (on average nine events during spring and summer each year), while the association with extreme events provides information on the health effects that occur during less frequent heat events (on average two events per year). Additional sensitivity analyses which assessed four alternative heat event definitions for associations with mortality from 1) all causes, 2) all cardiovascular disease and 3) all respiratory disease were conducted. These alternative heat-wave definitions were proposed by the Australian Bureau of Meteorology and the NSW Ministry of Health to capture the integrated experience of high temperatures over multiple days. The Excess Heat Factor (EHF) index proposed by Nairn et al. calculates the difference between the 3 day moving average (lags 0–2) of daily average temperature and the prior 30 day moving average (lags 3–32). This is then amplified by the difference of the three day average and the 95th percentile of daily average temperatures. Days with an EHF > 1 are defined as “heat-wave” days (EHF severe). As EHF > 1 occurs relatively frequently we also defined “extreme heat-wave” days as EHF > 80 percentile value (EHF extreme). The third definition which is NSW specific (NSW1)  identifies a heat wave as two consecutive days greater than the 95th percentile of maximum temperature for a given month. The fourth definition, also NSW specific (NSW2), proposes that a heat wave is any three day period with greater than the 90th percentile of maximum temperatures for that month in addition to a moving average of greater than 27°C maximum temperature for the 3 day period. We used a time-stratified case-crossover design, in which each case is their own control . Comparisons were made between the ‘event’ day (the day the case was admitted to hospital or died) and several referent ‘non-event’ days, with measured and unmeasured potential confounding factors such as age and smoking status controlled by design. The referent days were selected from the same month and year and matched by day of week to the health outcome. This time-stratified method of selecting comparison days ensures unbiased conditional logistic regression estimates and avoids bias resulting from time trends in examination of the environmental exposures . We used conditional logistic regression models to calculate odds ratios (OR) and 95% confidence intervals (CI) for mortality and hospital admission on extreme heat days (lag0, lag1, lag2, lag3, lag 0–2 days) compared to other days, adjusted for potential confounders and stratified by zone (ie: including an indicator for zone). The covariates were chosen a priori based on our literature review and were included in all models. To control for influenza in the model we included a dummy variable for daily counts of influenza admissions (ICD 10: J09 – J18) greater than the 90thpercentile of the Sydney GMR distribution. Single days within an influenza event lasting several days/weeks may dip below the 90thpercentile and we included these days as influenza event days. In addition, an indicator variable was added to the model to account for public holidays. School holidays were also included as an indicator variable when hospital admissions for asthma was the outcome as this group includes a substantial proportion of children. Table 1 summarises the covariates included in the statistical model (Table 1). Binary variable coded as 1 if school holidays and otherwise 0. Only included in childhood asthma models. Binary variable coded as 1 if public holiday and otherwise 0. Air pollution concentrations may also be elevated during extreme and severe heat events and so potential confounding by air pollution was assessed by conducting sensitivity analyses that included air pollutants (PM10 (24 hour average), PM2.5 (24 hour average), NO2 (1 hour maximum) and O3 (1 hour maximum)) separately in the models. Data on air pollutants were obtained from the NSW Office of Environment and Heritage. Daily region-wide average air pollution concentrations were calculated using daily data from all available monitoring stations in each of the five zones (monitoring stations: Sydney east, n = 4; Sydney west, n = 7; Gosford/Wyong, n = 0; Newcastle, n = 3; Illawarra, n = 3). Gosford/Wyong did not have any monitoring stations so those from the neighbouring city of Newcastle were used. Temperature distributions varied across the five climate zones studied and summary statistics including temperature thresholds are presented in Table 2. The monthly 95thpercentile thresholds in Sydney east ranged from 27.6°C in September to 32.8°C in January, while in Sydney west they ranged from 28.5°C in September to 35.4°C in January. Figure 2 shows heat event days as defined by the 99thpercentile and 95thpercentile for Sydney east for the period 1997 to 2007, as well as the four alternative heat wave definitions. Heat event days as defined by the 99th percentile and 95th percentile for Sydney East for the period 1997 to 2007, as well as the four alternative heat wave definitions. As the focus of this study is to inform the development of a HHWS, comparisons were made between mortality and hospital admissions associated with rare occurrences of single day and three day extreme heat events, and those of the more frequent single day and three day severe heat events. Results from the statistical model (without controlling for air pollutants) are reported. Including air pollutants in the model had little influence on the mortality results but did influence some results for hospital admissions and these are highlighted in the text. We found broadly similar associations between mortality and hospital admissions with single day events as well as three day events (lag 0 – 2). The largest single day lag was generally same day (lag0) although this did vary for hospital admissions. The results were also similar for extreme heat events and severe heat events defined using daily maximum temperature and daily maximum apparent temperature. The magnitude of the associations between the rare extreme events (99thpercentile definition) and the more frequent severe events (95thpercentile definition) was also generally similar. The magnitude of the associations was generally similar for all-age and 65 + years. The asthma hospital admissions results are reported for childhood asthma (1–14 years) and adult asthma (15–64 years) rather than all age asthma hospital admissions due to the different epidemiology of asthma in children and adults. The associations for mortality and hospital admissions with severe heat events (95thpercentile threshold) and extreme heat events (99thpercentile threshold) defined using maximum daily temperature are summarized in Table 3 and Table 4 respectively. The results highlighted in the text below are generally for single day severe events as the results for multiple day severe events and single and multiple day extreme events were usually similar. Results are presented in parentheses as percentile threshold, lag: (OR: 95% LCI – 95% UCI). All-cause mortality had similar magnitude associations with single day and three day extreme and severe events (95thpercentile lag0 (1.06: 1.03 – 1.09)). All cause hospital admissions also showed similar small magnitude associations with three day and single day extreme and severe events (95thpercentile, lag0 (1.02: 1.01 – 1.03)) although only the association with three day extreme events remained when ozone was included in the model (Table 5). Mortality from disorders of fluid, electrolyte and acid–base balance had large magnitude associations for single day (lag 1 day) and three day extreme and severe events (95thpercentile, lag1 (4.94:2.16 – 11.29)). However, mortality from dehydration was only weakly associated with single day (lag 1 day) and three day severe events (95thpercentile, lag1 (1.54: 0.93 – 2.53)) and not with extreme events. As expected we found large magnitude associations with hospital admissions for heat related injury and illness with single day and three day severe and extreme events (95thpercentile, lag0 (12.05: 8.91 – 16.30)) although controlling for air pollution approximately halved the magnitude of these associations. Three day and single day extreme and severe events showed similar magnitude associations with hospital admissions for dehydration (95thpercentile, lag0 (1.77: 1.60 – 1.97)) and admissions for disorders of fluid, electrolyte and acid base balance (95thpercentile, lag0 (1.27:1.14 – 1.42)), while controlling for ozone marginally reduced the magnitude of these associations. Cardiovascular mortality was associated with single day and three day extreme and severe events and the magnitude of these associations were larger for multiple day events compared to single day events (95thpercentile, lag0 (1.06: 1.01 – 1.12)) and these results were reflected in ischaemic heart disease mortality (95thpercentile, lag0 (1.07: 1.01 – 1.14)). Cerebrovascular disease mortality was associated with three day extreme events (99thpercentile, lag0-2 (1.15: 0.98 – 1.34)) but not single day extreme events, nor was it associated with three day or single day severe events. We found all cardiovascular admissions were inversely associated with single day extreme and severe heat events lagged 1 day (95thpercentile, lag1(0.96: 0.94 – 0.98) and these inverse associations were reflected in IHD (95thpercentile, lag1(0.96:0.93 – 0.98)) and cerebrovascular disease (95thpercentile, lag1(0.97: 0.88 – 0.97)). Respiratory mortality was associated with single day and three-day severe events, but not with extreme events at (95thpercentile, lag0 (1.14: 1.04 – 1.24). Pneumonia mortality was associated with single day extreme and severe events lag2 days (95thpercentile, lag2 (1.25:1.05 – 1.49) but not three day severe or extreme events. COPD mortality was associated with single day severe events (95thpercentile, lag0 (1.18:1.05 – 1.33), with a weaker association with three day severe events, while extreme events were not associated with COPD. Hospital admissions for all respiratory disorders were not associated with extreme events although there was a small magnitude association with three day and single day severe events (95thpercentile, lag 0 (1.03:1.01 – 1.05)). While these results were reflected in pneumonia admissions and COPD admissions the associations were generally weak and inconsistent. These weak associations with respiratory outcomes were generally eliminated when air pollutants were included in the models, particularly ozone and nitrogen dioxide. We found in inverse association between childhood asthma admissions and single day severe and extreme events (95thpercentile, lag0 (0.94: 0.89 – 1.01)). Controlling for air pollutants generally magnified this inverse association, particularly for ozone and nitrogen dioxide, such that three day severe and extreme events were also inversely associated with childhood asthma (heat + ozone model; 95thpercentile, lag0-2 (0.91: 0.84 – 0.98)). Adult asthma admissions were inversely associated with both single day and three day extreme and severe events and controlling for air pollution generally give similar results (95thpercentile, lag0 (0.92: 0.84 – 1.02)). Mortality from renal failure was not associated with extreme or severe events. Three day and single day extreme and severe events were associated with hospital admissions for disorders of the renal system with the strongest single day associations at lag1 and lag2 days (95thpercentile, lag1 (1.08: 1.05 – 1.12)). Controlling for air pollutants in the model reduced the magnitude and strength of these associations. Hospital admissions for urolithiasis (kidney stones) was associated with three day and single day extreme and severe events (95thpercentile, lag1 (1.18:1.02 – 1.25)). Admissions for renal failure were associated with three day extreme and severe events as well as single day severe events but not extreme events (95thpercentile, lag0 (1.26: 1.16 – 1.38)) although controlling for air pollutants reduced the magnitude of the associations with severe events and eliminated the association with three day extreme events. Diabetes mortality was associated with single day severe events (95thpercentile, lag0 (1.22:1.03 – 1.46) and weakly associated with three day severe events, but was not associated with extreme events. Hospital admissions for diabetes were associated with similar magnitude associations with three day and single day extreme and severe events (95thpercentile, lag0 (1.12: 1.06 – 1.18)). Controlling for air pollutants generally gave similar magnitude associations for diabetes hospitalisations although the strength of these associations was reduced with three day extreme and severe events. Deaths from all mental disorders were not associated with extreme or severe events for the all-ages group but were associated with single day extreme and severe events in the under 65 years age group lag 2 days (99thpercentile, lag2 (2.84: 1.24 – 6.52) and 95thpercentile, lag2 (1.53: 1.10 – 2.14)). Deaths from mental disorders (substance abuse) showed similar magnitude associations with single day and three day severe events (95thpercentile, lag0 (1.38: 1.01 – 1.88)) as well as single day extreme events at lag1 and lag 2 days (99thpercentile, lag1 (2.30: 1.19 – 4.44)) but not three day extreme events. Deaths from suicide were not associated with extreme events although there was a weak association with single day severe events lagged 3 days which only occurred in the under 65 year age group (95thpercentile, lag3 (1.19: 0.98 – 1.44)). Mortality from dementia was inversely associated with single day severe and extreme events lagged 3 days, but not three day events (95thpercentile, lag3, (0.83: 0.68 – 0.99)). Similarly, organic mental disorders were inversely associated with single day severe and extreme events lagged 3 days, but not three day events (95thpercentile, lag3 (0.85: 0.71 – 1.02)). Hospital admissions for all mental and behavioural disorders showed small magnitude associations with three day and single day extreme and severe events with the strongest single day association at lag1 days (95thpercentile, lag1 (1.02:1.00 – 1.05) (Table 6). While these results were reflected in various categories of hospital admissions for mental and behavioural disorders the associations were generally weak and inconsistent. Hospital admissions for mood disorders were weakly associated with three day and single day severe events (95thpercentile, lag1 (1.06:1.00 – 1.12)). Admissions for mental disorders related to substance abuse were weakly associated with three day and single day extreme events (99thpercentile, lag0 (1.08: 0.97 – 1.20)). Admissions for dementia were associated with single day severe events (95thpercentile, lag0 (1.14:0.99 – 1.31)) as were admissions for neurotic/ somatic/ stress (95thpercentile, lag0, (1.06:0.99 – 1.14)). There was no consistent pattern of change in results for mental disorder admissions when air pollutants were included in the model with the magnitude of some associations decreasing, for example, dementia with ozone included in model (95thpercentile, lag0 (1.08:0.92 – 1.28)). While the magnitude of some mental disorder admissions associations increased, for example, mental disorders related to substance abuse and PM2.5 (heat model: 99thpercentile, lag0-2 (1.06: 0.96 – 1.18); heat + PM2.5 model: 99thpercentile, lag0-2 (1.11: 0.99 – 1.25)). As hospital admissions for mental and behavioural disorders are unlikely to be causally related to air pollution, the change in the association with these outcomes suggests co-linearity may be influencing the ability of the model to assess the independent effects of heat and air pollution. Additional analyses that assessed the four alternative heatwave definitions designed to integrate the effect of high temperature over multiple days with all-cause, cardiovascular and respiratory mortality gave similar magnitude associations with these outcomes as the simpler heat wave definitions reported here. We found that single day and three day severe heat events were associated with increased mortality and hospital admission in the Sydney GMR as well as less frequent and more intense extreme heat events. Our study found broadly similar results irrespective of the definition and metric (maximum temperature or apparent temperature) used to define heat events, consistent with the finding of Khalaj et al. and Barnett et al. [9, 38]. While air pollution does not appear to confound the association between mortality and heat events, we found evidence of confounding by air pollution with some hospital admissions outcomes, particularly respiratory outcomes and ozone. The associations for some hospital admissions outcomes that were influenced by controlling for air pollutants in the statistical model are unlikely to be causally related to air pollution, for example heat related injury. This suggests that co-linearity between air pollutants and heat events may be influencing the ability of the model to assess the independent effects of heat and air pollution. Our findings suggest mortality from disorders associated with fluid imbalance, as well as cardiovascular disease, pneumonia, COPD, diabetes, and mental disorders related to substance abuse are associated with heat events. As expected heat events were associated with substantial increases in hospital admissions for dehydration, other disorders of fluid, electrolyte and acid base balance, and heat related injury. We also found that heat events were associated with hospital admissions for renal disease, diabetes, and mental and behavioural disorders. These increases in mortality and hospitalisation during heat events place an additional load on already stretched emergency services, hospitals and the health system. As expected hospital admission for heat related injury, disorders of fluid balance and dehydration had large magnitude associations with both single day and three day extreme and severe events. While deaths from dehydration were only weakly associated with severe events we found a large magnitude association with other fluid disorders and both severe and extreme events. We found mortality and hospital admissions for mental disorders were associated with both single day and three day extreme and severe heat events. Deaths from all mental and behavioural disorders were associated with single day extreme and severe events in the under 65 year age group but not the all-age group. This was reflected in associations for hospital admissions for all mental and behavioural disorders with extreme and severe events. There was some consistency in the results for mortality and hospital admissions for mental disorders related to substance abuse with both outcomes associated with extreme events and mortality associated with severe events. The results for other sub categories of mortality and admissions for mental disorders were mixed. While we found inverse associations for mortality from organic mental disorders and dementia mainly with single day severe events these outcomes had very low daily counts with limited statistical power. We found weak positive associations with hospital admissions for mood, dementia, and somatic/neurotic/stress disorders and mainly single day severe events. Associations between heat events and mental and behavioural disorders have been found elsewhere [11, 39]. A study in Adelaide, Australia found heat-waves were associated with mortality due to a range of mental health disorders . The increased intensity and duration of heat-waves in Adelaide may explain the weaker associations with mortality we found in Sydney. Psychotropic drugs are commonly used by people with mental and behavioural disorders and these drugs may interfere with body temperature regulation to exacerbate the effects of heat-waves . In Khalaj’s recent Sydney study, an association between hospital admission for mental and behavioural disorders, as both a primary diagnoses (compared with persons admitted for other conditions) and as an underlying diagnosis, (compared with persons admitted who did not have the condition)  was found. We found a weak association between suicide in the under 65 year age group and single day severe events. This result should be treated with caution as many papers have explored links between suicide and temperature and produced conflicting results [41–44]. Some studies have found a decreased suicide risk with increasing temperature , while in others an increased risk was observed . One study found a U-shaped response with elevated suicide risk on extremely cold and warm days . Our study contributes to the emerging literature in this area. We found hospital admissions for renal failure, diabetes and urolithiasis were associated with extreme and severe heat events. While mortality from renal failure was not associated with heat events the small number of deaths coded to renal failure limit the statistical power of the analysis to find an association if one was present. A recent study in France found heat waves were associated with renal failure and that these effects were larger in elderly patients . It is reasonable to assume that these associations may be related to increased fluid loss and subsequent altered fluid balance and dehydration. While diabetes hospital admissions were associated with singe day and three day severe and extreme events, diabetes mortality was only weakly associated with single day and three day severe events. Once again the small number of deaths coded to diabetes limits the statistical power of the analysis to find an association if one were present. Disturbances to the fluid balance resulting from high temperature could also be a contributing factor to the observed associations with diabetes . Cardiovascular disease mortality and the related outcomes of IHD and cerebrovascular disease were associated with single day and three severe and extreme events. Conversely we found weak inverse associations with single day extreme and severe events for all cardiovascular admissions, as well as IHD and cerebrovascular disease admissions. This suggests that heat events may lead to a rapid deterioration in existing cardiovascular disease resulting in death, and that this may occur during rare extreme events as well as the more frequent severe events. European studies have similarly found an association between heat-waves and cardiovascular mortality but not for hospital admissions where cardiovascular disease was the primary cause [47–51]. Khalaj’s 2010 Sydney case-only study did not find any association between heat-waves and hospital admissions for cardiovascular disease as the primary diagnosis (compared with persons admitted for other conditions) but did find an association with cardiovascular disease as an underlying diagnosis (compared with persons admitted who did not have the condition). This suggests that an underlying condition of cardiovascular disease modifies the effect of heat on hospital admissions for a range of other conditions [9, 52]. Whilst respiratory mortality was associated with single day and three day severe events, it was generally not associated with extreme events, although once again the small number of deaths coded to respiratory mortality limits the statistical power of the analysis to find an association if one were present, especially for less frequent extreme events. While respiratory hospital admissions were associated with heat events all associations were eliminated when we controlled for the effects of air pollution, particularly ozone. Air pollution is associated with respiratory morbidity [53–55] and studies suggest that ozone can confound the association with heat for cardiovascular and respiratory outcomes . Air pollution concentrations are influenced by weather and ozone in particular is correlated with temperature . Heat and air pollution may have independent effects of respiratory outcomes however co-linearity may be influencing the ability of our statistical model to assess the independent effects of heat and air pollution and work is starting to emerge exploring the issue of confounding and effect modification of heat by air pollution . More broadly, our finding that the effects of heat on some hospital admissions disease groups are sensitive to the effect of air pollution, particularly O3 and NO2, is consistent with previous work that identified this phenomenon in the 2003 heatwave in France . We found an inverse association with single day and three day extreme events for childhood asthma, and for both severe and extreme events for adult asthma. Asthma time series data, particularly for children, is difficult to model . Probably because children are more likely to experience frequent respiratory epidemics and because school holidays influence hospital admission rates . The protective effect for asthma may also be due to the warm moist air associated with heat events in Sydney’s temperate climate. Asthma is known to by triggered by inhaling cold dry air, and in an experimental study, warm moist air has been shown to protect the airway disruption associated with exercise . It is also possible that on very hot days, people with asthma stay inside more, and are reluctant to exercise due to concerns for triggering an asthma attack. A recent Sydney case-only study found heat waves were associated with increased hospital admissions with respiratory disease as an underlying diagnosis (compared with persons admitted who did not have the condition) suggesting that an underlying condition of respiratory disease modifies the effect of heat on hospital admissions for a range of other conditions . Our sensitivity analyses suggest that, at least for mortality, the use of heatwave metrics designed to reflect multiple day events that meet detailed heatwave criteria produce broadly similar results to those found with single day heat metrics such as maximum daily air temperature, or a simple 3 day moving average. The key strengths of this study include our use of long mortality and hospital admission time series, the wide range of diagnosis groups assessed our adjustment for the potential confounding effects of humidity and our assessment of the influence of air pollution on the heat associations. As with similar ecological time series studies we were limited by the lack of more detailed individual level data on exposure including other potential confounding factors such as the use of air conditioning during heat events, Similar to many other studies of the effects of heat on mortality or hospitalisation we used a time stratified case crossover analysis that has the benefit of controlling for the effects of unmeasured confounding factors that do not vary over time by design. An alternative statistical approach would be to use Poisson regression time series analysis. A recent paper by Guo et al. suggests that case crossover designs may not control for autocorrelation as effectively as time series analysis when assessing air pollution effects on mortality due in part to lack of control for seasonal effects. However, the generalizability of these concerns to our study assessing the effects of extreme heat in interrupted time series analyses of spring and summer months, and to our study location is unclear . The different exposure metrics, different lag effects and large range of mortality and hospitalisation outcomes assessed in our study introduces the potential problem of multiple comparisons. This results in an increased probability of detecting a statistically significant finding by chance alone and the greater potential for spurious results to be reported. One approach to multiple testing suggests using more stringent P-values to account for the larger number of comparisons being conducted, although this can cause more problems than it intends to solve and no correction for multiple comparisons was made in our study . Although this increased the chances of finding spurious associations, it reduced the chances of missing any important associations. Our results summary focuses on consistent lag effects rather than statistically significant effects with erratic lag structures. This study highlights the increased risk of hospitalisation and death during heat events from cardiovascular disease, diabetes and mental health disorders. These chronic conditions are an important issue in today’s society . The aged population are at increased risk of heat-related illness from a range of factors including decreased thermoregulation and an increased prevalence of chronic diseases disease, and these factors contribute to the increased risk of heat related death [66, 67]. Many health agencies including the NSW Ministry of Health have implemented programs to improve management of chronic disease in the hope of reducing potentially avoidable admissions . This study provides similar results to research conducted in the Northern Hemisphere regarding the effect of heatwaves on levels of mortality and morbidity and outlines the importance of including HHWS and heat management plans as part of chronic disease management. The purpose of this study was to provide data in the Australian context which will inform the development of a Heatwave Health Warning System for NSW. The findings of this study indicate that days with unusually high ambient temperatures increase mortality and hospitalisation from a range of conditions. Ebi and colleagues highlighted the costs and benefits of the establishment of a HHWS in Philadephia, with the benefits of implementing a HHWS far outweighing the costs . We identified increases in mortality and morbidity for a range of conditions on both single and three day severe and extreme events, and a HHWS in NSW based on these thresholds would need to be activated on average one or two times per year for extreme events and around ten times per year for more frequent severe events. Compliance with a HHWS is a critical factor in maximising the protective effect of the warning system and frequent alerts may reduce compliance in the target population. It is recommended that in NSW the HHWS be implemented at the first one or two occurrences of temperatures above the 95th percentile of average monthly temperature (severe event level) from the beginning of spring (September) and thereafter at all occurrences of temperatures above the 99th percentile of average monthly temperature (extreme event level) until the end of summer (February) in order to maximise health protection and reduce complacency. Public health messages associated with all heat health warnings should emphasise the importance of maintaining hydration, particularly for people who have chronic diseases whether the temperature be severe or extreme. The authors would like to acknowledge the contributions made by Glenis Lloyd, NSW Health and the members of the Heatwave Health Warning System steering Committee. Funding for this project was provided through NSW Health and Department of Environment Climate Change and Water. GM, FJ and BJ conceived and developed the overall study and conducted the data reviews. LW helped develop the study, assisted with data analysis and prepared the manuscript. IH developed the analysis methods and conducted data analysis. HA-Y conducted data analysis. RB and CG critically reviewed the manuscript and provided advice during study development. All authors read and approved the final manuscript.